For more options, please use our Custom Request. Our notepads are backed with hard cardboard backing with glue on the top edge. Personalized notepads, promotional notepads or custom printed notepads can be a great way to market your small business, restaurant, or start-up organization. Custom printed notepads with your business logo can easily make your business or organization a household name by spreading recognition among customers. Don’t just place your logo on your personalized notepads though. Remember to include other aspects, such as address, phone number, email address or even your personal business motto on your promotional notepads. Placing all of this useful information on your custom printed notepads can give you an advantage over your competition by giving your potential customers all the necessary contact information in one convenient place. Promotional notepads can be given away to potential patrons at networking functions, trade shows, as special gift items or sent in the mail with advertisements. 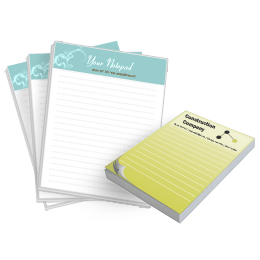 By placing your business logo and information on personalized notepads, people will read your information each time they use them. Additionally, any time someone jots down a note for another person on one of these custom printed notepads, that person will also read your business information. Soon, your small business or organization will become widely recognized as a result of marketing and advertising strategies with promotional notepads, personalized notepads and custom printed notepads.